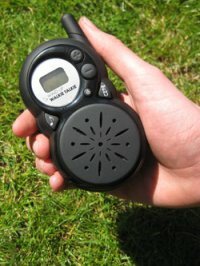 For folks who want to pick up a pair of walkie talkies for your own use this summer, why not take on an eco-friendly stance with the new Wind Up Walkie Talkies? After all, there really isn’t any reason to fill up our earth with even more batteries, and on the other hand you will get some decent amount of exercise once you’re done juicing up your Walkie Talkies. Powered by a dynamo mechanism using good, reliable old-fashioned wind up muscle, this strapping set of two-way walkie talkies provide a hassle-free way to keep in touch. That means no more batteries and no more getting caught short without them. Stay in touch up to 3km away while you’re camping in the great outdoors, enjoying a day at the park, trip to the seaside, shopping centres and festivals. At full power each walkie talkie radio provides a whopping 1 hour 30 minutes of talk time and 8 hours standby, although just a few cranks will provide enough power for a quick location update, roger roger, over and out. Added features include an LCD display, 8 channels and a 6V mains adapter which you can use to charge your wind up walkie talkies via the mains before you embark on your next big outdoor adventure. Get yours today, over! You can pick up the Wind Up Walkie Talkies for £49.95 a pair.